Hyperbolic name aside, the Iomega SuperHero actually could save the day—or at least your photos and contacts. 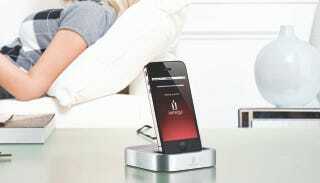 It's an iPhone dock that syncs your info, saving you the trouble of plugging into your computer every night. Just how much of a burden that is currently is between you and your (smartphone) maker, but Iomega's solution is a convenient one for those who don't want to sync to iTunes every single time they charge. The device comes with an SD card slot (and included 4GB SD card), and an app lets you decide what info gets synced every time you charge. SuperHero can back up multiple phones, and is compatible with iPhone 4, 3GS, and 3G, as well as third and fourth generation iPod Touches. The SuperHero will be available this month for $70. Sure, you could save yourself the cash by sucking it up and syncing with iTunes every night. But if you're either extra-cautious or extra-lazy or both, it may just be worth it. Iomega SuperHero Backup and Charger for iPhone! the new Iomega® SuperHero™ Backup and Charger for iPhone. time you charge the phone. your phone, much less never being able to retrieve those unique photos on the phone. values the data on their phones as much or more than the phone itself." Las Vegas. Iomega's tradeshow booth is located in the South Hall 3 (booth # 31553). with the Super Hero Backup and Charger. iPhone in the SuperHero dock and selecting the "restore" button. iPhone 4, 3GS and 3G, as well as the iPod Touch (third and fourth generation). worldwide for $69.99. (U.S. suggested retail pricing. ).